Caia Trimble drills a mid-range jumper in the fourth quarter against Simi Valley. The youthful duo of Caia Trimble and Athena Saragoza combined for 37 points and led the Santa Barbara High girls basketball team to a 67-54 victory over visiting Simi Valley, on Thursday night at J.R. Richards gymnasium. It was the fifth consecutive victory for the Dons, who are near the end of a string of non-league games and took a break from Santa Barbara Tournament of Champions play for the matchup with Simi Valley. 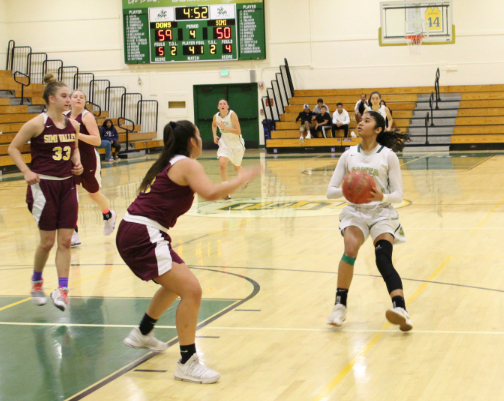 The opening minutes of the game swung drastically in Simi Valley’s favor as the Pioneers took a 15-6 lead on a turnaround jumper by Alicia Porter, who finished with a game-high 24 points, eight of which came in the first quarter. However, Santa Barbara countered with a 17-2 run beginning midway through the first quarter that concluded with a pull-up bank shot by Mireya Gil with just over seven minutes remaining in the second quarter. A flurry of steals and transition baskets by the Dons extended the lead to 41-27 at halftime, after Trimble connected on a corner three-pointer just before the buzzer sounded. “I want to give our girls credit for working hard in the press because I’ve seen other teams press them this year and it hasn’t given them problems,” Butcher said. Simi Valley cut its deficit to 41-34 at the 6:05 mark of the third quarter on a transition basket by Porter, but that’s as close as they would come. Santa Barbara kept the Pioneers at arm’s length by scoring before the defense could set up a Saragoza layup increased the lead to 51-36 with 3:52 remaining in the third quarter. Maya Banks, who grabbed 14 rebounds and consistently found herself at the right place at the right time on both ends of the court, was a boost for the Dons. “She is kind of the heart of the team if you really think about,” said Butcher of Banks. “She is just everywhere for us and she does such a great job. Santa Barbara (9-6 overall, 2-0 Channel League) will take on Foothill Tech on Friday at 4 p.m.